Did you know that most Americans did not choose their career? Their career sort of chose them. (I’m sure that you don’t fall into that category). We are taught to go to school, get a job, pay your bills, be happy and shut up. Many people wake up around 40 or 50 years old and realize their job is stealing their soul. There is a low hum of frustration in that person's life because they know, deep down, that they should be doing something else with their life. At this point many people look at trying to change their path and take control over their career and life. Sometimes people turn to franchising because franchising allows someone to be a business owner almost immediately and control their day to day life and have freedom to make choices. The issue is, we are not taught how to buy a business or what to looking for in a great franchise model. Many people buy into a franchise concept for the wrong reasons. Some people say to me that they want to get into the food business because, hey, everyone gotta eat, right? There's built-in demand. That may be true, however, how do you know if the food industry is right for you? Will it fit into your life style? And, if it does, how do you know which franchise company to pick? The nuances are endless. My wife and I recently visited a franchised smoothie shop. The drink was exceptional. The service and the atmosphere was above average. I had a conversation with the owner of the shop. She talked about how the rent was radically low - and it was. I asked her why they choose this particular franchise? Without hesitation she said, oh, we LOVE smoothies! When we exited the beautiful shop, I turned to my wife and said, they will be out of business in a year. I was wrong, it was 9 months. It doesn't matter how much you like a product or service, being on the other side of the counter is an entirely different experience. There are many mistakes that people make when choosing a franchise. They think they know the questions to ask to evaluate a business. The Road to Franchise Freedom_eBook, the e-Book I wrote with my friend, colleague and mentor, Matt Stevens, gives 21 questions or items to think about that most first-time buyers don't know to even consider. As a franchise consultant who has owned and operated franchises and even failed in one, my job is to prepare my candidate for the education and discovery process, match them properly with fitting franchise options, coach them through the canyon between common perception (the customer perspective of a brand) and reality a franchise owner in a particular company. I do so honestly and objectively, so that they can progress in judging the merits of an opportunity’s suitability to their goals without my interference. In my professional opinion and experience, it’s a waste of time to discuss company “B" when company “A" operates a similar model but shows superior franchisee results and much higher success and profitability rates. For the same reasons, if the candidate’s "Ownership Criteria" generally matches a specific industry, there's no reason to discuss every sub-standard concept within that industry. Instead we just investigate the best one in that industry that meet our eight criteria and is geographically available in the buyer’s backyard or as close to them as possible. Growth: A franchise company’s net unit growth affects the intrinsic value of your individual franchise business, the future stability of the supporting franchisor, and the eventual resale value of your business when you consider your Personal Exit Strategy. To build wealth, would you rather own a growing system or one that’s shrinking? Top systems are growing. Leadership: Regardless of how long the company has been franchising, the leaders of the company should have significant franchise experience, or they darn well should have started the company themselves. Lack of franchise-experienced leadership at the helm often results in unhappy, unsupported franchise owners living back in the same nasty corporate environment they daydreamed of leaving in the first place. Do you want to find yourself among unit retraction, system-wide retrenchment, or financial and home office restructuring due to misguided leadership when you’re working to create your own wealth, income, security and dreams? Top systems enjoy integrity-based, franchise-familiar experience and leadership. Relationships: Franchise companies can either choose to find a sucker who’ll buy the rights to the franchise name, regardless of their chances for success, or they can seek valuable, long-term partners in the business. Franchisors that build strong relationships with their owners are usually highly regarded in the training they deliver, the training they facilitate beyond your startup, and the support they avail to you on a continual basis, often because they care enough about you to do so. Top systems look for partners and build businesses with their franchisees, regardless of the system’s name recognition. Unfortunately, some of the most prolific names in franchising have high franchisee turnover and failure rates as well as poor relationships with their operators. Top systems earn their income from ongoing royalties that come from ongoing franchisee success, not from one-time hits via franchise fees. Transparency: Would you believe that some franchise systems require you to travel to their home office for a dog and pony show prior to ever sharing information with you? I work with franchisors that are looking for business partners for their systems and reciprocate a desired partner behavior. In part, that means they provide information—starting with generalities and working toward specifics—that will help you determine their ability to be the catalyst you’re looking for. Great franchisors don’t want everyone or anyone; they want the right one just as much as you do. And they’re willing to admit when they’re looking at the “wrong” candidate. They invite your questions and judgment while identifying your strengths and weaknesses as they pertain to your involvement in that business. Top systems provide a mutually educational review process. Validation: Individual franchise owners “live it” daily. If the great majority of owners speak positively about their own expectations of the business having been met, and they express satisfaction with the franchisor, that’s a positive sign. When franchisees are satisfied because the concept has generally met their expectations at all levels of performance throughout the business growth curve, we’re onto something worthwhile. Top systems validate well. Litigation: Though most people have better things to do, ours is an increasingly litigious society. It would be unexpected to find a franchisor with over one hundred units, or that has been in business for ten or more years, without at least some involvement in several lawsuits. However, if a large number of franchise owners have initiated legal proceedings against the franchise company, it’s most often a train wreck any way you slice it. Top systems set proper expectation with the planned intentions, resources, and ability to meet them, and they work hard to suspend the bad habits of owners while supporting their positive, result-driven behaviors. Top systems would rather fix a problem than win, or lose, a lawsuit utilizing a very expensive attorney. Top systems could be on either side of litigation, but they are not habitual defendants. Success: The variance between the long-term success rates of franchised businesses versus non-franchised businesses is stunning. The industry benchmark rate of eighty-five percent (six out of seven) franchise owners succeeding is minimally acceptable. (Owner retention does include owner sales of stores, which are likely to be for very positive reasons and often by design.) Top systems enjoy better than eight-five percent franchise owner retention year after year. Great systems are even higher at ninety percent. Very few systems exceed ninety-five percent. Franchisee Profitability: It will take time for you to grow any business. However, some concepts take years to net a dime. Whether or not a franchise company makes formal earnings claims, it’s fair to eliminate concepts that have not proven to be profitable for their existing owners. By their own design and systems, top concepts will generate cash faster than their industry competitors, and most importantly, the franchisor and the franchisees will recognize how and why they do. The great thing about investigating a franchise as opposed to a business opportunity or even a private business that is for sale is, in a franchise, the eight criteria will be available for you to validate. Moreover, you have a wide variety of franchisees to interview from different walks of life, in various parts of the country, and with different professional backgrounds. When speaking with the existing franchisees of any franchised outfit, you’ll be able to ascertain the culture and whether you fit in. I can’t think of any other investment that allows you to do that type of evaluation or investigation. 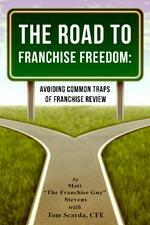 For more on common mistakes made in a franchise review, download (no charge) my e-book, The Road to Franchise Freedom, today.